The What: multiCAM Systems, an integrated video production specialist serving the broadcast and professional AV markets, will unveil its first self-branded PTZ camera for live production at the upcoming ISE 2018 Show (February 6-9, Amsterdam RAI, Stand 13-F140). The hybrid IP and SDI camera line, branded as mCam, will be available for use with each of the company’s integrated production systems. This gives commercial AV and broadcast customers the option to purchase turnkey systems direct from multiCAM Systems or its global channel partners. The What Else: multiCAM Systems’ integrated video production systems such as CONF and TRACKING are used in corporate, education, and other AV environments to capture, record, and/or stream live presentations, lectures, and events. The open design of each system, as well as MULTICAM RADIO for Visual Radio broadcasting applications, enables interoperability with most leading PTZ cameras today, including models from Canon, Lumens, Marshall, Panasonic, PTZOptics, and Sony. 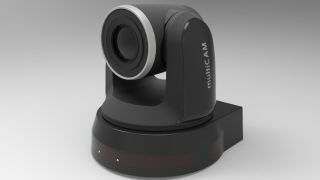 While customers will still enjoy that freedom of camera choice, multiCAM Systems is bringing the 1080p camera to market with several goals in mind to reduce costs and complexity for integrators and end users. This includes planning a transition to IP that first allows customers to take advantage of existing SDI infrastructure, as well as accelerating integration times to get users up and running with their systems quicker. mCam cameras are built to make that switch between the two environments as painless as possible, supporting high color reproduction and 1080p image quality in both SDI and IP. The design features rear 3G HD-SDI connections, as well an RJ45 Ethernet jack for video signal control over the network. Power over Ethernet (PoE) capability is enabled when integrated with a standard switch. To expedite delivery and integration times, mCam cameras are automatically flashed with the appropriate firmware before shipping. This removes several configuration steps, which means customers can technically be operational within an hour of unboxing if the supporting SDI or IP infrastructure is in place. The Bottom Line: mCam cameras can operate in manual, automated, or hybrid mode, and provides users with an intuitive way to easily program presets for specific shots. The design includes a hardware joystick and is interoperable with virtual joysticks built into the multiCAM Systems’ integrated production systems, both of which allows users to manipulate pan, tile, zoom, focus, white balance, exposure, and similar movements and settings.